Alison Boland, a film graduate student at the University of Texas, made a short documentary entitled “Under One Sky” about the Austin-based group Interfaith Action of Central Texas (iACT). The film shows two different iACT programs: the Hands on Housing home repair program and the Red Bench Interfaith Conversation series. The film includes interviews with several faith leaders who are active in iACT. Tom Davis, the Public Information Officer of Live Oak Local Council, is one of those leaders. "Several members of Live Oak are active in iACT. Our involvement has done a lot to help the people of Austin’s faith communities understand that Wiccans are also people of faith – just a different faith." The 11-minute film can be viewed on-line at http://vimeo.com/55984225. Today began my journey to India and the Kumbh Mela. I started in San Francisco at 3:00AM and have been flying for 14 hours so far. First to New York, and then to Amsterdam. I am now sitting in the airport in Amsterdam, waiting for my flight to Delhi. I have a five hour layover and am tired, but also anxious and excited to reach India. I am accompanied by my assistant, Dr. Harriett Nettles of Washington, DC, who will journey with me for the first three weeks. Harriett will care for me and help free me up to focus on my role as a spiritual leader. When I arrive at my first stop in Varanasi, I have been asked to come and bless the students at a beautiful university there called SMS. I will also give a speech there and talk with students in the management programs about how to change the current business paradigm which has led to huge poverty worldwide and the devastation of our planet and its resources, to a new one which is inclusive and acknowledges the sacredness of every human being. I believe that teaching our youth to incorporate these concepts, is one of the ways that we can alter the course of our history and create a better society. Right now I am tired but dedicated. I believe the task before us is huge but possible. We just need to step up and each take responsibility ... not just for ourselves, but for our communities and our planet's future. We each have gifts and skills to contribute, and if we do, things will change! We don't have to be the whole tree, just the seed. Plant that idea, and the possibilities are endless. I am touching down in Delhi now and hope to catch a short rest before continuing on to Varanasi. This will be a long and grueling journey filled with both adventure and optimism. May I have the strength to go the distance, and the guidance to make the right choices and say the right things. And may that voice that serves as my touchstone be loud and clear. Blessings to All and may we find ways to Peace! ... is hope. And that is the reason I'm here! After a quick shower, I was taken to the university. I was both surprised and honored to be greeted by a large banner at the school's entrance with my name and a welcome message. Both Harriett and I were whisked away to a meeting room where we were given tea and sweets, and the introduced to those who oversaw the school. Harriett was invited to speak with me, and gave a wonderful short talk on how Hindu culture and practices has become a part of the fabric of America. Then I was introduced, and I spoke on the importance of including spirituality and an honoring of our fellow brothers and sisters in our business practices. I pressed for a new narrative for business which throws out the old model that we must claw our way to the top and diminish those below us in order to succeed. And to insert instead that success should be the result of people wanting to do business with you because you both honored and saw them in your transactions, and that you use your gifts to contribute to a better society and world. The talk went well, and I was graciously presented with a bouquet of flowers and a wonderful plaque commentating the occasion. Then I offered to meet with the students and answer their questions. 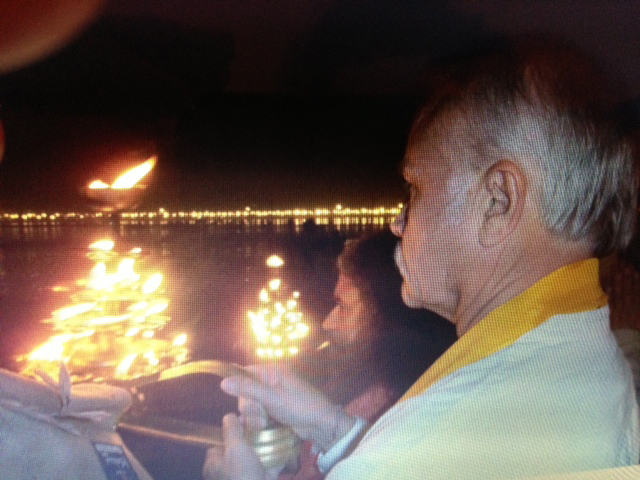 When all was done, we were returned to our hotel and then taken to the Ganges to Aarti, a sacred ritual to Lord Shiva and the Goddess Ganga. Then in a rickshaws back to the hotel, for a very late dinner and a good night's sleep. Tomorrow, we we travel to Allahbad and the Kumbh Mela. It is projected that it will be at least a ten mile walk through the crowd of pilgrims to get to the center where I will camp at the sacred Sangam, the confluence of the three sacred rivers. I made my way out of the camp and down the path to the stairway that led to the sangam. I walked with long haired saints dressed in robes of white and saffron as the music of harmoniums joined with the songs and chants of the people. Cameras flashed and press recorded, catching the moment for those who could not be present. A remote miniature helicopter with TV cameras and four sets of spinning blades hovered above us, moving here and there with incredible precision trying to record the un-recordable. People rushed past security and tried to wade into the river with cell phones to be the one who caught the picture that could be shown to their families and friends for generations to come to prove they were here. And as quickly as they were rebuked and pushed back into the crowd, another took their place. The river stretched wide before me shimmering in the last light of day as tiny waves and swirling currents created sacred patterns from the shattered light. Long slender boats with pilgrims glided across the surface far away and candles were lit on their graceful bows filled with hope that their petitions might be answered. A silent ancient red fortress stared back across the river from the far banks miles away. It had seen millennia of these gatherings, but none like this, for this would be the largest coming together of people in all of time! I just had the indescribable experience of participating in the first blessing of the Kumbh Mela with a small group of India's foremost saints. 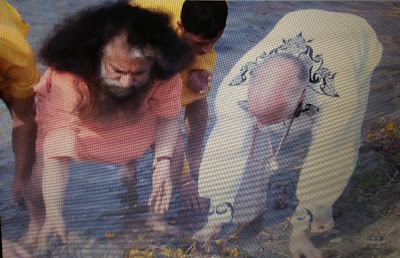 I got to sit right in the very front right behind Puja Swami Saraswati on the water's edge, at the exact point where the worlds most sacred rivers meet at the Sangam. I then had the exquisite honor to bless the first rose petals offered to the river and then participated in each successive blessing. To grasp the magnitude of this, one needs to understand that of the millions and millions of pilgrims present and of the thousands of spiritual leaders from all across the world attending the Kumbh, only our small group were allowed at the actual Sangam. The millions of other pilgrims as far as you could see, were held back a mile at the closest. The press used a miniature television camera on a remote control helicopter hovering above us, to film and transmit the sacred moment. As I entered the river, the swirling waters reflected the light of candles and lanterns residing both on boats and on the ancient Red Fort built by Achabar on the opposite distant shore. It was dark now, but the river itself seemed to carry a luminescence. And with all of the noise of literally a nation's population of people, their was such silence at the river that I could hear my own heart beat. The water was cool but not cold when I entered. And the sense of the auspicious moment shot through me like an electric current as I shared blessings for all humanity and asked for peace between all the peoples of the earth. And I also shared a blessing for our tired planet itself, praying for rejuvenation and a rebalancing of its resources. I asked for understanding of difference and that those who strived to claim exclusivity, find instead beauty in diversity. And I gave blessings to those who sought truth or meaning or who felt lost or forgotten, that they might find their way. And then I let the river bless me. Following the blessings and the end of the first ceremony, I followed the Swami back to our camp to reflect on the coming together of so many people for such great purpose. And I now write to capture the moment. Tomorrow will be the first auspicious bathing day and I hope to spend the rest of the evening in deep reflection on what I should share. How my life has brought me to this, I can't begin to imagine. And so I shall just remain humbled by it and hope that my blessings come to be. My hands are still wet from the river as I write this. And so may each of you who read it, no matter how far in the future or distant at this time, receive these blessings as you read them. Feel and take to your heart all that was presented. May the first blessings of the Kumbh be with you too. The sound of millions of people and their hopes and prayers surround me on this sacred night. May I not forget it. I must first apologize that I have not posted this earlier. The return from Guatemala saw me infected with a virus that settled in my lungs and settled me in bed until around the 26th. I got up for a bit on my partner’s birthday and did precious little else through the first of the year. I am much better now and wished to get this report to you. I will be filing two more reports as well. These will be shorter reports, the first on the explicit ritual forms that we used and how they varied in practice from those that most Neo-Pagans are used to, while the second will cover some of the differences in organization between the groups that came together and how that affected our meetings as well as the issues that were discussed while we were together. I left San Francisco early in the morning to participate in a gathering of indigenous people from Canada to Chile and Argentina called “The People of the Eagle the Condor and the Quetzal.“ I arrived in Guatemala around 8:30 in the evening. The first thing I discovered when I arrived was that Verizon wireless had lied to me. My phone did not work in Guatemala and nowhere did they sell burners. I was completely without communication unless I found a WIFI connection which would allow me to use Skype. Further, despite the fact that the Radisson is a major hotel close to the Airport, none of the porters seemed to have heard of it. When I finally found a man carrying the Radisson sign, he told me to wait at some tables inside. Imagine my delight after spending the entire day alone, in finding Raul there waiting for the Radisson shuttle as well. He welcomes me with a huge hug which made the day bright and shiny all over again. Once at the Radisson, I touched base with everyone who had arrived, met some new folks, and hit the hay. Next morning we arose at six, had breakfast in the hotel, and headed down the street to a meeting space for a full day's worth of meetings. We all recognized that there might be some problems with translation when I explained to them that I was not only half of deaf, I hadn't really practiced my Spanish for almost three years, and was not familiar with the dialect in use. The conversation went something like "hi, I'll be your translator today, I'm deaf." Everyone got a pretty good chuckle out of that, and as we were with a small group, everyone was patient. By the end of the day my Spanish had improved greatly. By dinner, many more folks and arrived and it was a party. We were all up by six the next morning, and after breakfast at the hotel, boarded the bus for a 2 hour ride to Chimaltenango. There we stopped in front of a yard that said steakhouse, but proved to have been turned into a private residence. There was afterwards some grumbling that we had been misled about the steaks. There we were smudged so thoroughly, that had I not held my breath I might have suffered serious asthma. Clouds of thick black smoke filled the air making it very difficult to breathe. For the smudging compound they used the ubiquitous copal, a tree resin, along with other plant resins, barks, leaves and pitch pine . As each of us was cleansed we moved to another table where we filled out a sheet of paper which included our name and affiliated tradition as well as the area we were from, and were given a beaded bracelet to wear. it said " time of b'aqtun" which is the date upon which the epoch turns more or less. These bracelets were tied around our wrists for the duration of our trip. We were then ushered back to the bus, each of us having received a sack lunch. Said lunch consisted of cooked plantains, an orange, an apple, and a mango. We boarded the bus again to head for Iximche, a sacred site near to Tata Apolinaro's home. Here we spent the rest of the day in ritual. At six that evening, having accumulated yet more people for a rough estimate of about 60 folks, we returned to the steakhouse for dinner. It is at this point that a few clever people discovered the Burger King next door. Not only were the sanitary facilities about 200 years ahead, you could get a burger and fries for a very good price. As there was only one bathroom, such as it was, at the statehouse, the "great excuse" became " I need to use the bathroom" for anyone who decided to slip away. At this point I should tell you about the food, and the people preparing it, as well as the conditions under which they were doing so. The " kitchen" was a corrugated tin shed, dark, smoky, and half underground, with a fire in one corner a couple of miss matched tables, and piles of baskets and sacks full of produce stacked all over the place. The actual preparation was done in women's laps and cooked over the fire on heated stones. The women doing the cooking were all Mayan from various places around Guatemala. Many of them had traveled 6 hours by bus to work with us. All of the food that we ate from this point: in the trip was typical Mayan fare, cooked in typical Mayan fashion. Keep in mind that they were cooking for between 50 to 60 people in this fashion. I've never been hosted with such care and diligence. Nothing was wasted. You would often see for breakfast the next morning what had not been fully used the night before. Spanish soup served with tortillas, black beans and Chayote squash made for a filling dinner while Spanish soup served with tortillas, black beans and strangely prepared scrambled eggs (probably with chunks of Chayote squash) were breakfast the next morning . After dinner it was soon to bed. My roommates were an interesting mix. Fany was from Panama, Sophia from Chile, Luisa from Columbia, and Audrey from Alabama. As I was the only bilingual person in the room all conversation pretty much went through me. The girls insisted that I translate all conversation so that no one was left out and we had a great time. We had just gone to bed when Alejandrino and Raul came knocking on the door to tell us that everyone except Audrey was wanted in a meeting of the IIG (Initiativa Indigenous Global). As it turned out there was nowhere to hold that meeting except in our room so poor Audrey ended up listening to a bunch of foreign chatter while trying to sleep. We were all exhausted by the time that that meeting was over. We were up at six the next morning and off to the steakhouse again for the afore-mentioned breakfast. Only my determination to honor the hard work of the cooks kept me from grabbing an egg and sausage sandwich from next door. Why must the Gods tempt us so? The same place was then set up for ritual and thus we passed the day. Part of it was a lecture from Tata (Grandfather) on how the Mayan people are losing their understanding of spirituality, only burning Copal and incense and not understanding at all why or how to do things. He discussed at length an explanation of the Mayan calendar as well and we mourned the loss of Jake Swamp Wolf Clan leader of the Mohawk, who had passed beyond. We also gave time to our brother Don Frew who could not attend due to illness. For him we did a healing work and Don tells me that for the three days that we were in ritual he felt fine. My personal contract with the Gods was that any energy that I took from circle would go to him. The second part of the day was given to the Wolf Clan of the Mohawk people and Jake's daughter, who is the clan mother. I will talk about this at length in my next installment. We didn't get lunch til four in the afternoon and then things broke down into general conversation so some of us returned to the bus were the seats were softer. After it became apparent that nothing much was going to happen a few of us went over to the Burger King for ice cream. It turned out that they had planned to feed us again at six and some bright person put a stop to it thank the heavens. Then they asked how many wanted to go back to the lodgings and how many wanted to stay til dinner now set for seven. It was a half and half split and I opted for the lodgings along with all of my roommates. We spent the evening getting ready for bed, telling jokes and packing for the next leg of our trip. By the time we were ready for bed we were laughing at everything and pretty tired. We had just turned off the lights but were still wise-cracking when once again the three of us were called to meeting. Everyone wanted to know what we were laughing at and that started a new round of jokes which drew others from the surrounding rooms. It took a while to get the meeting under control and it was 12 before we got back to bed. The bus was supposed to arrive for us at 6 so we were up at 5:30 figuring that we were pushing the bubble a bit but then we ended up waiting for an hour (during which we could have slept in). Hanna, the youngest of our crew at 18, and a young Mohawk of the Wolf Clan got his La Cross stick and ball out and started to practice. My friend Calixto, a Bolivian Shaman and Catholic Deccan, decided that he wanted to try it and immediately tossed it over the wall where a roof dog (a regular means of house protection) caught it and ran tail wagging, delighted that someone wanted to play. The rest of the wait was spent in a hilarious series of efforts to get the ball back without waking the people who lived in the house. I have no idea how they managed it but they did get it back just as the bus pulled in. After breakfast at the steakhouse, back on the bus, we headed out to CHWANIMAB’ÄJ (Mixco Viejo ("Old Mixco"). Two hours of driving brought us to a really nice supermarket in the middle of nowhere where we grabbed as much junk food as we could carry. I wanted potato chips and asked for them in every variation of dialect that I could think of with no recognition. I finally said “you know…those thin little slices of potato that are fried” “Oh…” he said, “Layes.” Strange…the one word I hadn’t thought to try. Two more hours over what can only very generously be called a road, tossed from side to side, forward and back, up and down, and I was pretty much ready to get out and walk, which at the speed we were going was not a totally outrageous idea. We finally did arrive at our next sacred site and then had about a quarter mile walk over and through ruins to the plaza where we were to hold the ritual. Once we got there I discovered that I had to climb a series of very steep and narrow steps to reach the area. Everyone was worried about how I would accomplish this until I simply demonstrated how I usually go upstairs without handrails, on hands and feet. Apparently this was such a novel approach that no one had thought of it. Not partially dignified but safe, they later insisted that I ascend and descend all the stairs that way that way. I suppose the idea of trying to get in the way of a body tumbling down stone steps was not necessarily appealing to them. Some young men carried instruments the entire way also ascending those steep narrow steps without mishap all so that we could have music. I must say that I was amazed at the size of this ruin. It covered a huge valley’s length and breath- taking good advantage of a natural drainage system of rivers and streams. Sadly today all of that has dried up. From my point of view on this plaza I could look over the valley and see many similar plazas, ball courts and other clusters of ruins. Thousands must once have populated this valley if not tens of thousands. We stayed again til four in the afternoon, working ritual, singing, dancing, and enjoying the view. I crashed on the grass for an hour or so and someone covered me with a light scarf to keep the bugs off. We walked back to the bus and once again took the “road” back to the town it originated in. This time we did not have it to ourselves and several times had to try to maneuver past trucks often backing up for quite a distance before finding a place wide enough to do so. It took three hours to get back to the town of Xilotepek, and I was very glad to see it thinking we were done with travel for the day. Not a chance. The bus driver said that we had another five minutes as he wove through town to find yet another almost road heading up a mountain and out of town once again. “Just another five minutes” he said. About forty-minutes later and well after dark, we rolled into the sanctuary where we would be spending the rest of our time. Tata immediately stood and said that everyone was to take care of the Grandmothers first seeing that they got off the bus and to their spaces. I stood to see whether I could help anyone but wasn’t thinks too clearly for the pain that had spread across my back over the long drive. Next thing I knew I was out of the bus and some men were carrying my stuff. I stopped them and explained that we needed to take care of the grandmothers first. They gave me a strange look and explained that they were. It was then that it hit me that most of the women that I had been referring to as “grandmother” or “nana” were actually much younger than me. I was, in fact, the second oldest woman there, the oldest being Grandma Char at eighty years of age. Still it was a bit disappointing to think that they viewed me as a doddering old woman. I mean these other women had white hair and…and…well stuff. I did stop calling women twenty years my junior grandma and started calling them sister. I was ushered to the upstairs middle room and asked whom I would like to share it with. I’m not certain what happened to Audry but the rest of the crew was there and soon sorted it all out with those “helping” me. My friend Deborah Bender had loaned me a back packer’s cushion and down mummy bag so I was warm and comfortable despite sleeping in a cinderblock cave on stone floors. I had also brought my pillow and a heavy blanket but lost the blanket on the first night when I realized that Fany had planned to sleep on her shawl with a scarf over the top of her. It dropped down to forty-three degrees and what body heat we generated was sucked up by the stone floors so quickly that no one (except me) got any real rest at all. The place where we stayed was all cement cinderblock, stone tiles, and steel. Steel doors and window frames, stone tile floors and un-dressed walls. The main room was probably thirty feet wide by sixty feet long with a high peeked roof which was open and covered by another roof the space between the two open to the air as in many barns. To one side there were two rooms and behind a panel a stair lead to an upstairs with a larger room at both ends and one smaller one in the middle. None of these rooms had any furnishing or finishing and were completely empty. The kitchen was outside and very much what we had been using at the Steakhouse. A huge 100 gallon drum was set on a constant fire and served as all the hot water available. The bathrooms were cement out houses with formed cement seats which my tender nether parts found uniquely disturbing, sort of like sitting on a rock. Showers were tarp enclosures with a stool, a plastic wash bowl, a smaller bowl to scoop water, and all the scalding hot water you could carry. All of the water was well water and included the mud that came up with the bucket. You simply cannot imagine the exhilarating feeling of standing wet and naked in 63 degrees with a light wind at your back, despite the tarp which was only shoulder high. While the days were in the 50s to 60s it was pretty overcast most of the time and the nights, as I mentioned, were dropping into the low 40s so I was always a bit cold except for the few moments of sun that I could find during the day. The next three days were really about the same. The fire in the middle of the floor of the large interior space was tended 24/7 and the drum next to it kept up a heartbeat rhythm with fire tenders and drummers changing out every hour. At six each morning ( just in case you thought we got to sleep in) we were awakened by Marimba and drums,( live musicians, no volume control), and staggered down to morning ceremonies at the grandfather fire. Breakfast after that and a day of meeting (the only break from the music) followed by lunch (and more music) followed by more meeting. I would swear that they were playing some weird arrangement of “Smokey the Bear”, and “Oh Suzanna” about half the time. As the meetings continued I found myself sort of grouped in with the North American First Nations folks, (as they wanted a bit more clarification about what was going on than the translator was able to give,) and we got to know each other fairly well. On the second day we took a break from meeting and walked to a site used for ritual about a half mile from where we were staying. This was to be a healing ritual and much smudging and preparation followed by handfuls of sticky resins and candles were given to us to offer for the healing of any who might need it. Once again on this third day of such ritual I offered up requests for healing for my friends in need and after songs and prayers from many of the participants we walked back down the hill to the camp. By the time that we were wrapping up the meeting people were pretty tired and looking forward to heading back to the city. We held a final closing ritual at which I was asked to dismiss one of the quarters, and the fire was extinguished. Just before we were ready to pull out I grabbed a cup full of ashes from the sacred fire to bring home for other rituals and climbed on the bus. We traveled back down into town and stopped at the huge market there. I stayed in the bus beginning to worry that three days of fire and smoke might be taking more of a toll than was going to prove easily manageable. My breathing had become a bit labored if I tried to move around too much. After we got back to the Radisson in Guatemala City we were told that we had half an hour to clean up and get to the meeting place down the street for dinner. I opted out choosing instead to take a very hot bath, sitting in the steamy bath for some time before getting out and packing up. I ordered room service and promptly after went to bed. My roommate came in a bit later and quietly went to bed as well. About four in the morning she awoke with horrible intestinal issues and I gave her two of my Cipero to help with the issue. She was asleep when I left in the morning so it must have worked. She was leaving Guatemala to go to Puerto Rico next and had been traveling pretty much all over before coming to Guatemala. I did not envy her. Next morning I dressed and went downstairs to check out and leave for the airport in hopes of changing my flight. I had no luck but did get to say goodbye to many of the North American friends that I had made as we sat around waiting for various flights. Mine took me to Miami where I passed through customs which was empty, then on to my connecting flight to San Francisco. By the time that I got home it was clear that I was suffering from a bronchial infection and bed never looked so good. I’d worry about getting well tomorrow. Covenant of the Goddess observes moment of silence in unison for Newtown, Connecticut. 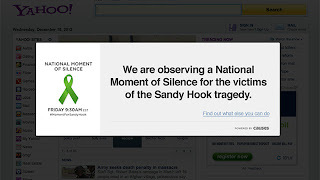 At 9:30 AM this morning, bells rang, silence cloaked, and thousands, perhaps millions, of websites went "dark" in an effort to remember and honor the victims of the Newtown shooting. 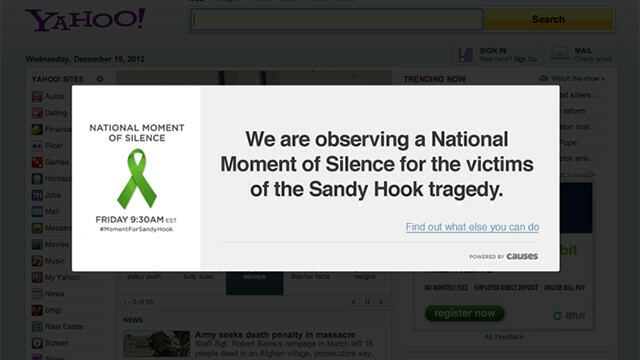 Our own CoGWeb also "went dark" for that minute of silence and prayer with the attached graphic displayed. Thank you to Daryl Fuller, our trusty Webweaver, for managing this tribute with only hours of notice. I truly appreciate the Service!!"